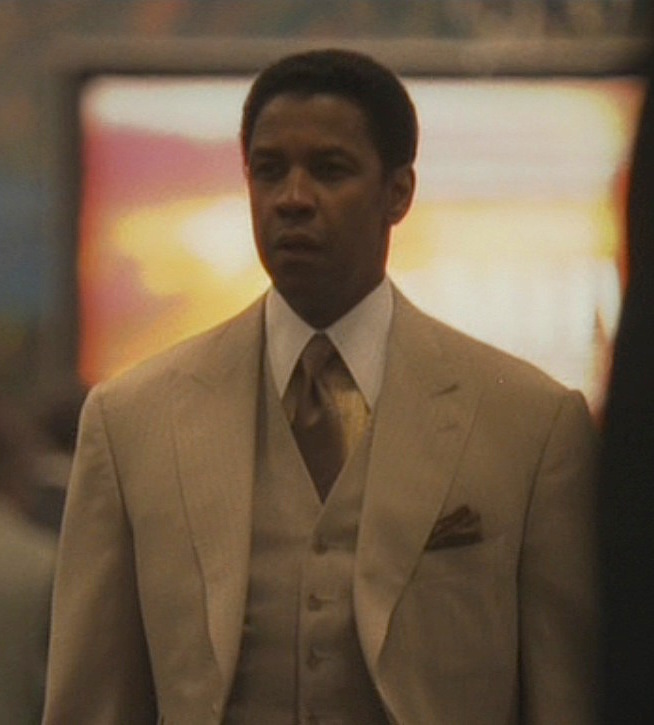 Frank Lucas takes pride in not looking too flashy like some of his contemporary gangster pals, but this suit is a considerable – though not unattractive – exception to his rule. 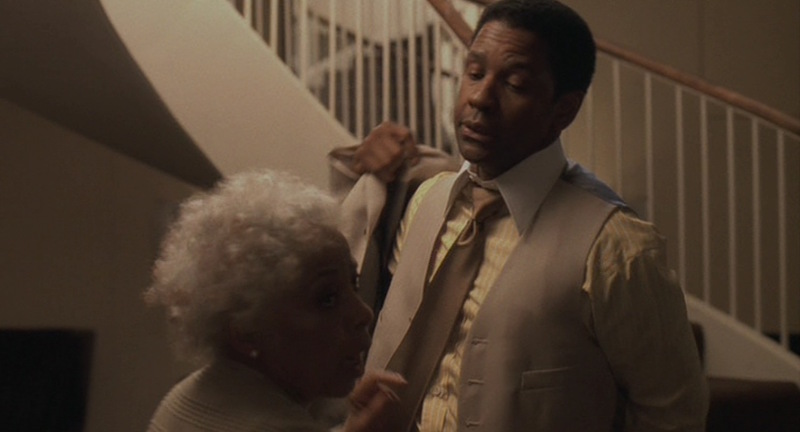 However, it’s telling that this is one of the last outfits that Frank wears before his eventual arrest. Frank’s tan striped three-piece suit recalls an admittedly gaudier look sported by NYPD Detective Trupo earlier in the film when local detective Richie Roberts encounters a white-suited Trupo and his corrupt cronies in Newark. Now, Trupo has broken into Frank’s home, stolen his cash, and – most unforgivably – kills his dog. In a rage, Frank arms himself and prepares to go after the crooked cop… but his mother stops him, threatening that both she and Frank’s wife Eva will leave him if he takes this drastic step. Faced with these unintended consequences of his pursuits and the possibility that he is becoming the sort of criminal he hates, Frank takes a step back. 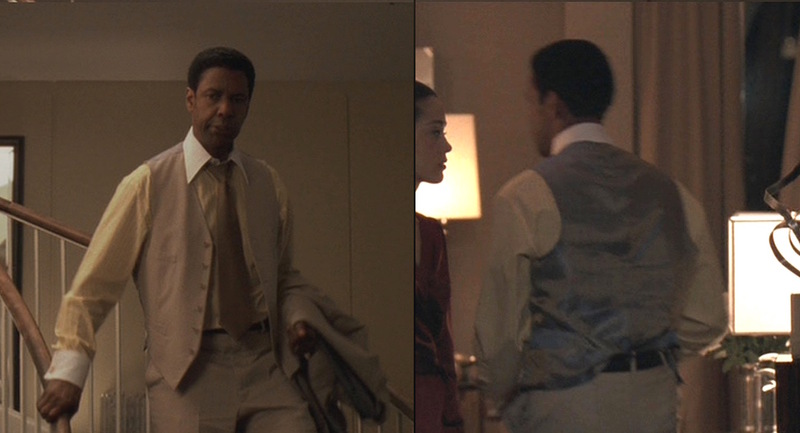 Frank Lucas’s tan striped three-piece suit is one of the louder costume pieces that Leonard Logsdail tailored for Denzel Washington to wear in American Gangster. The tonal pinstripe reflects its surrounding light, appearing white in bright or natural lighting and brown under dark lighting. All of the buttons are tan and brown urea buttons. The single-breasted suit jacket is tailored similarly to Frank’s other jackets with shoulders well-padded to create a strong look that slopes down from the neck to the roped sleeveheads. Although it’s too late to suggest a change of occupation, Frank’s mother is able to lend him some sage wisdom that likely saves a few lives. Many styling details are straight from the ’70s. The peak lapels are wide and sharp with a buttonhole through the left lapel. The front is darted, and the back is split by a very long single vent that extends more than a foot, up to just above the waistline. The rear-slanting hip pockets, including the ticket pocket, are widely flapped. The jacket closes with two buttons in the front and 4-button “kissing” cuffs on the end of each sleeve. My, how times have changed at the airport! Frank wears a brown silk pocket square in his breast pocket that matches his tie. The outline of the entire kerchief in his pocket can be seen in some shots. Note Frank’s brown silk pocket square. The matching suit vest has six buttons down the front to the notched bottom. There are four welt pockets – two upper and two lower. The back of the vest is iridescent silk that reflects blue in certain light. A back strap fastens through a silver-toned buckle to adjust the fit. A furious Frank moves through his house without his jacket on. The flat front suit trousers have a straight fly and on-seam side pockets. His dark leather belt appears to be a dark brown, matching the rest of the outfit’s earth tones, with a squared steel single-claw buckle. 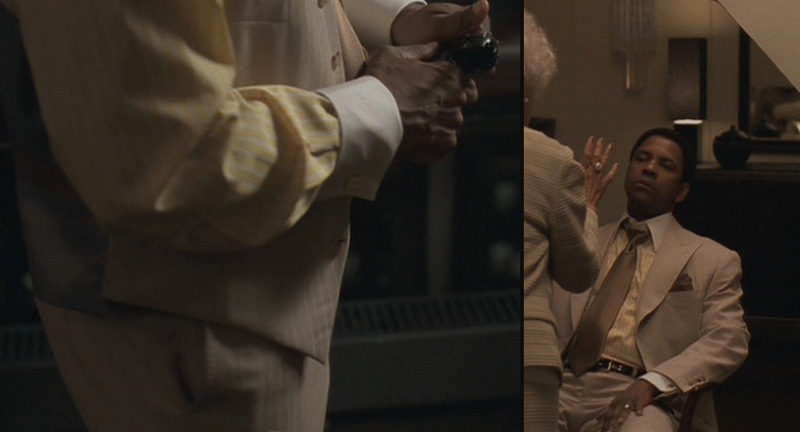 We never see below Frank’s shins on screen, but the trousers bottoms are likely plain-hemmed like his others. 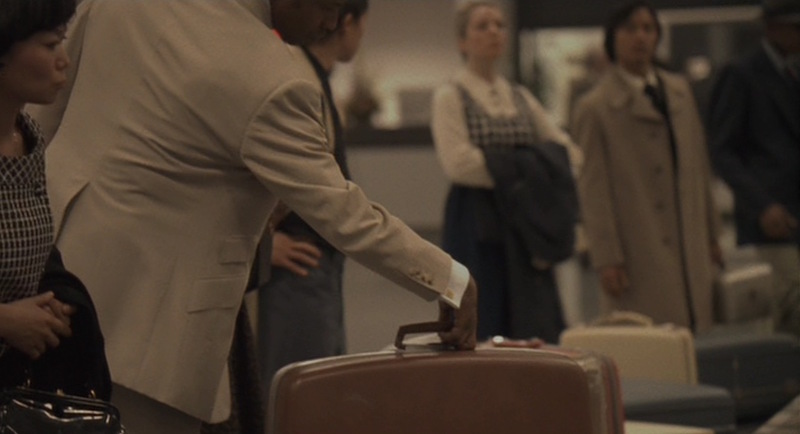 He may be wearing the same brown medallion-toe balmorals as he did with his light brown suit earlier in the film. In fact, this could be called a slightly flashier variation of that earlier outfit, as he also wears a yellow shirt and brown silk tie with this earth-toned suit. This yellow shirt is much more elaborate with white striping throughout and a white contrast collar and cuffs. It has a front placket and a very large collar as collar points had grown much longer by 1973. 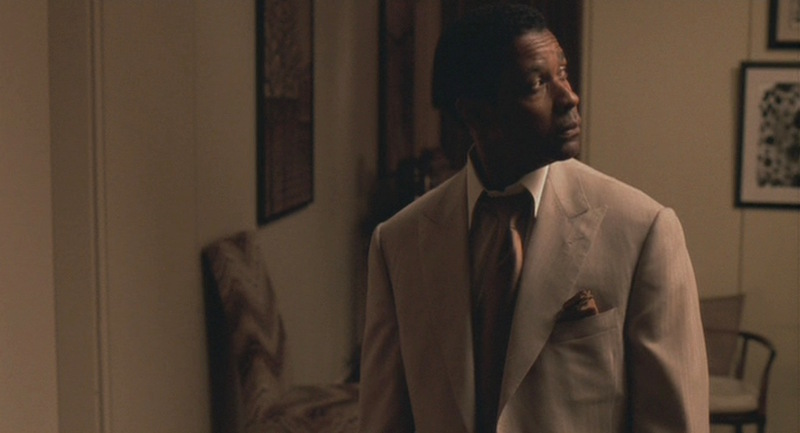 The squared double cuffs are fastened by a pair of gold rectangle links, which seem to be a Frank Lucas favorite. Frank puts his jacket on to get ready for a confrontation and ends up in a much more dangerous one than he expected. 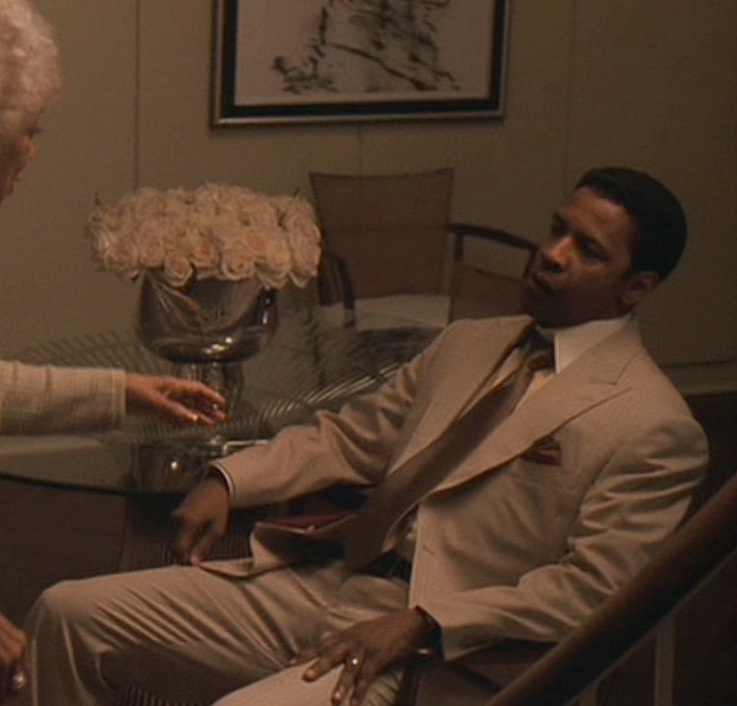 Frank wears the same gold wristwatch that he wears throughout the rest of American Gangster with a square white dial on a gold bracelet. He wears a gold wedding band on the symbolic third finger of his left hand. 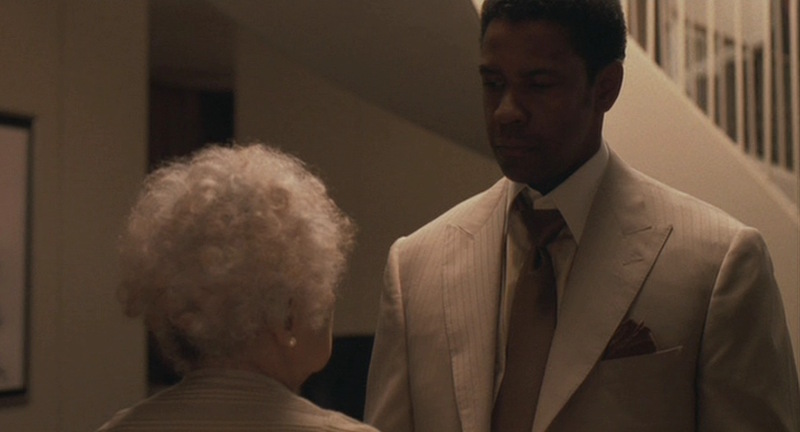 Frank Lucas’s loudest outfit is one of the last ones he is seen wearing before his arrest, a none-too-insignificant observation. 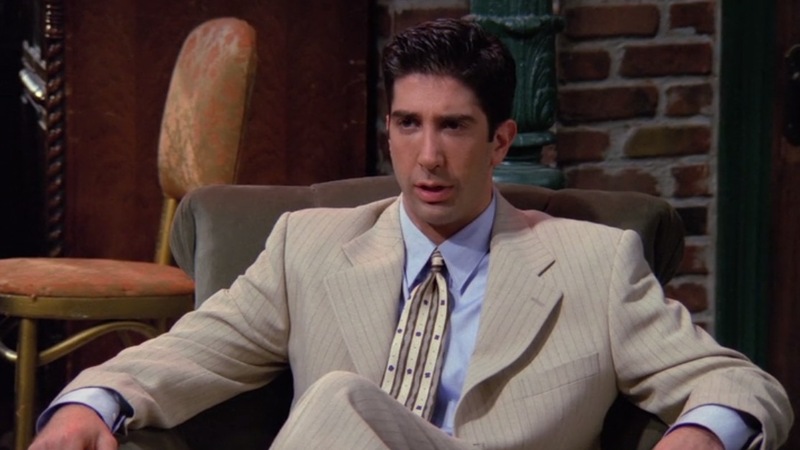 On the total opposite end of the badassery spectrum, Ross Geller (David Schwimmer) also tried to pull off a tan striped suit in a second season episode of Friends, “The One Where Heckles Dies” (Episode 2.03). This is likely the only appearance that David Schwimmer will ever make on this blog.